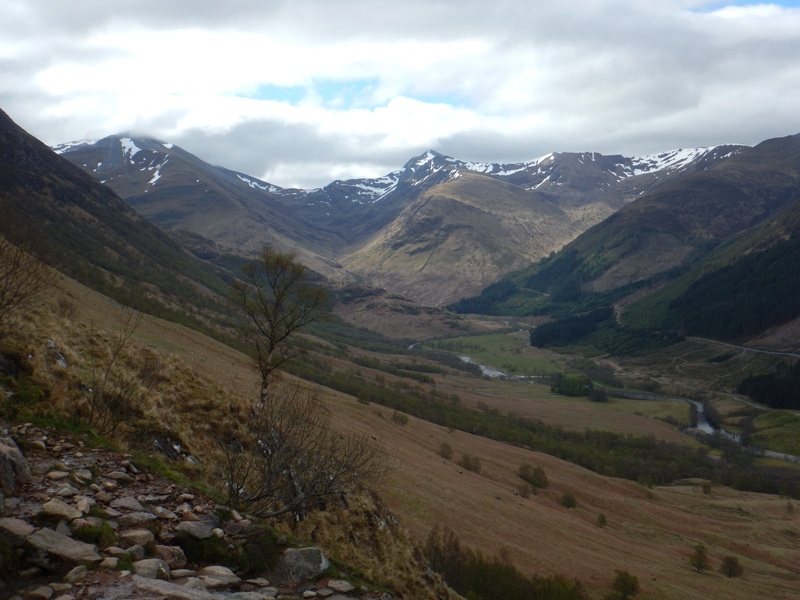 Sitting at 1,344m (4,409ft) Ben Nevis is not only the tallest mountain in Scotland but also in the UK. To conquer this huge mountain plan on 7 hours hiking, 4 going up and 3 coming down. It is such a great hike with some breath taking views along the way. We were lucky enough to do it on a sunny day with great weather. This made the hike very enjoyable and the the uphill climb a little more bearable. Getting an early start at 9am, we were on our way. The initial ascent is pretty gradual but this did not last for long. With the first set of switch backs, uneven ground over large rocks started. 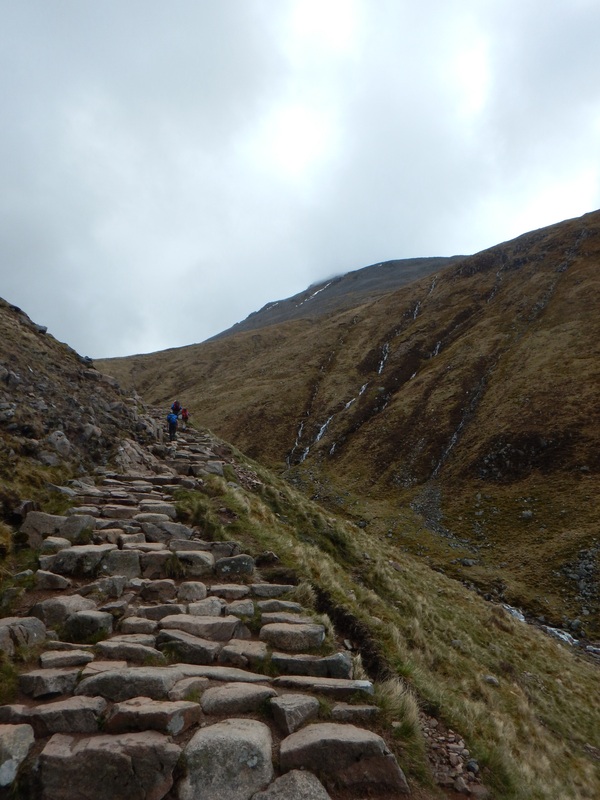 It was tough going climbing up until the path flattened back out at the lochan. This is where the trail turned back to gravel and widened back up some. 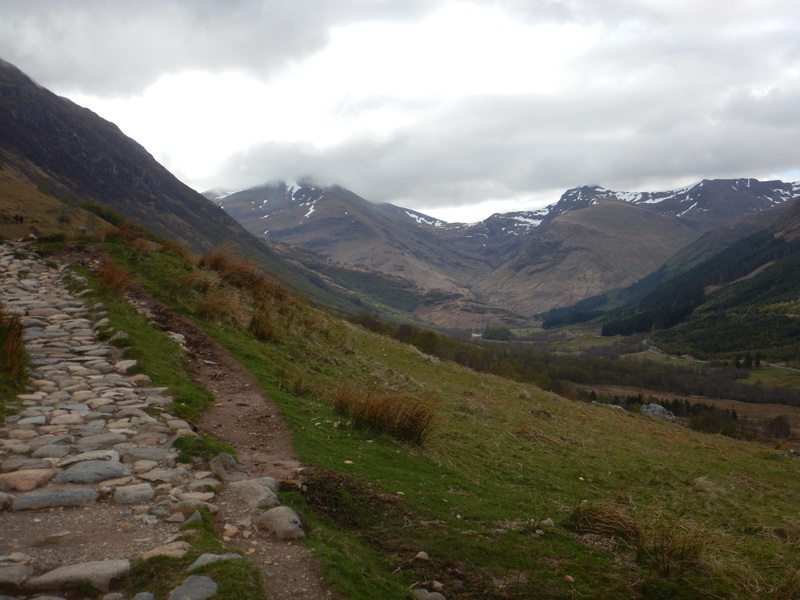 Looking down into the valley and adjacent mountain range, was one worth stopping for and enjoying. As we continued on, the second set of switch backs began. Seven to be exact and this time it was over loose gravel where you would find your feet slipping from time to time. The gradient was steep and we continued on one switch back after another. 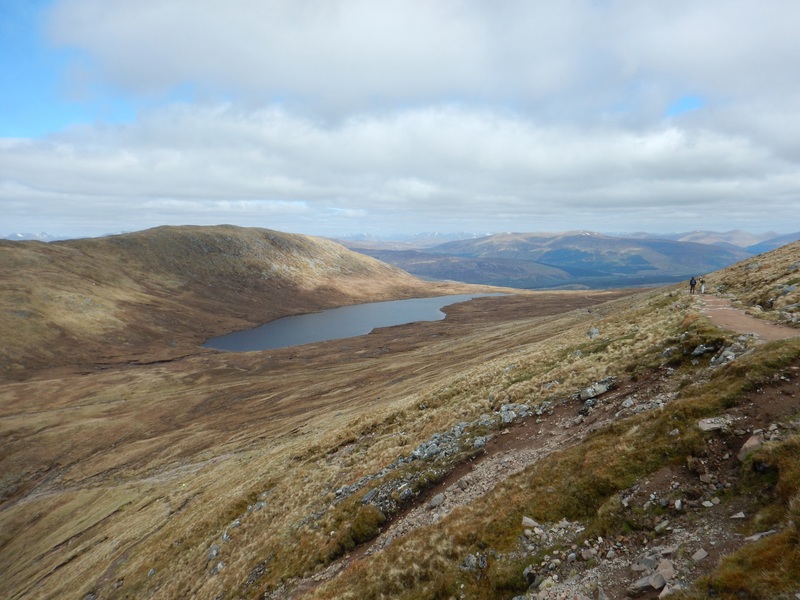 Occasionally, looking back to view the lochan and path below. 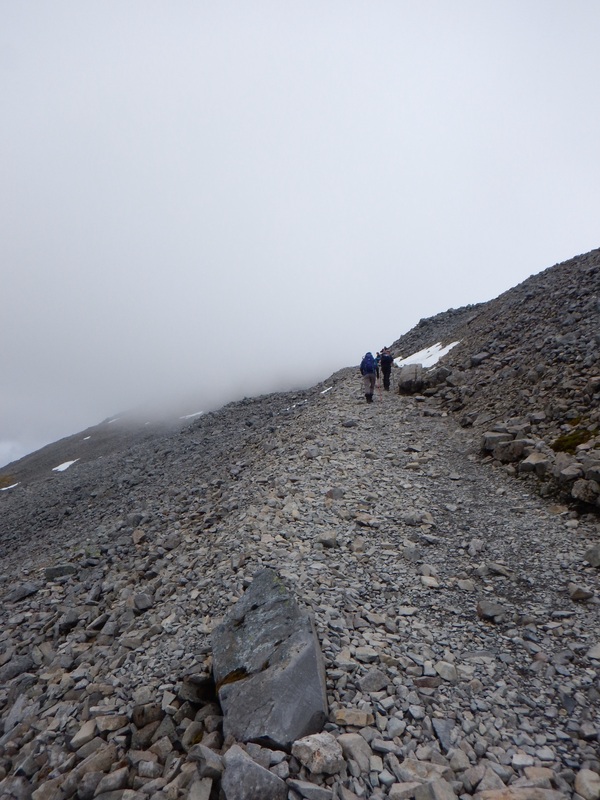 Traces of snow also began to appear as the hike ascended higher and higher. Just as the switch backs finished, the snow started. Digging our feet into the snow for each step, still didn’t keep the feet from sinking in and slipping. Since it was a warm day with the sun shining brightly, the snow was soft and not frozen. 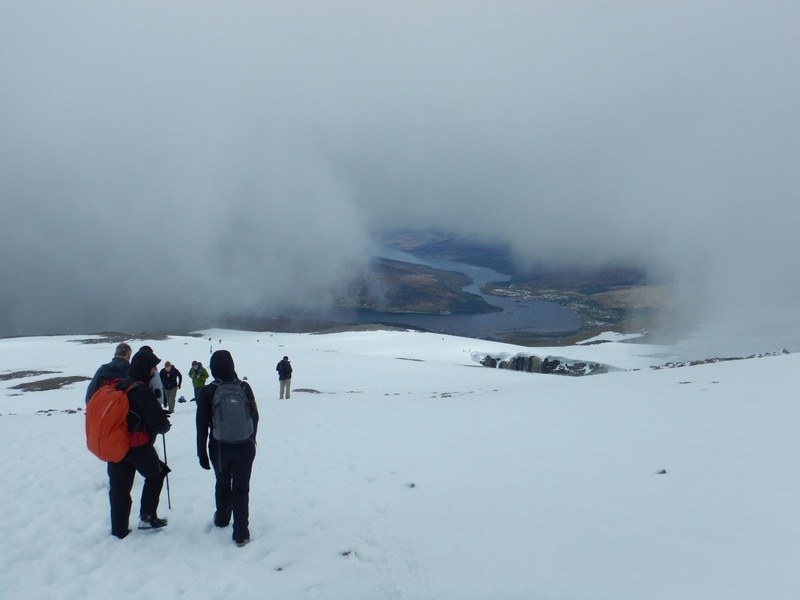 This was key to making the journey to the summit. If the snow was frozen, we would have had to turn back. Trekking through the snow making steady progress, we ascended into the haziness of the cloud cover. The views below were gone and the summit was getting closer with each step. 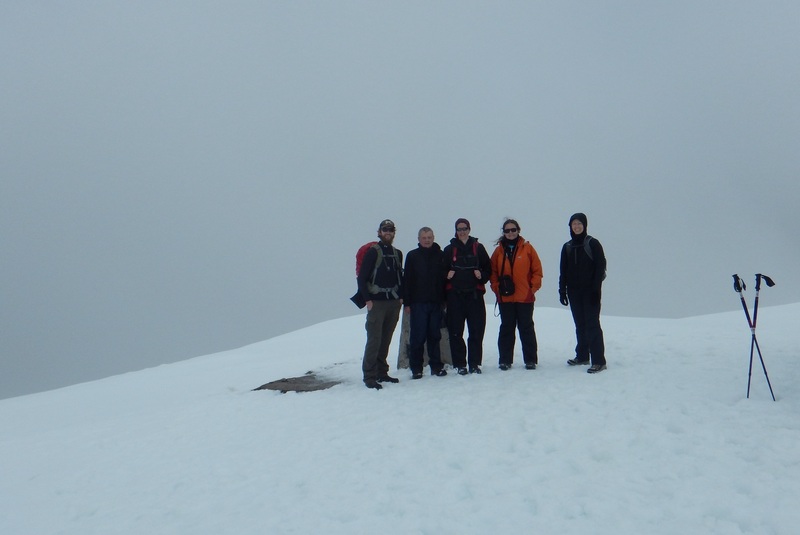 After climbing through the snow for roughly 45 minutes with a few breathers on the way, we had made it to the summit. 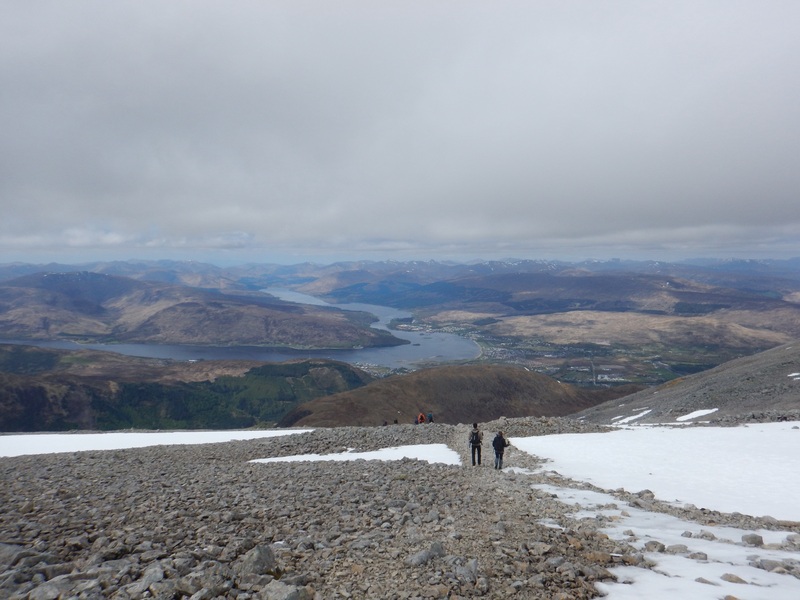 Scotland’s highest peak had been conquered! Unfortunately the cloud cover remained at the top while we were there but that didn’t stop us from enjoying a nice lunch with the great weather that day. The temperature at the top was around 7C (45F). 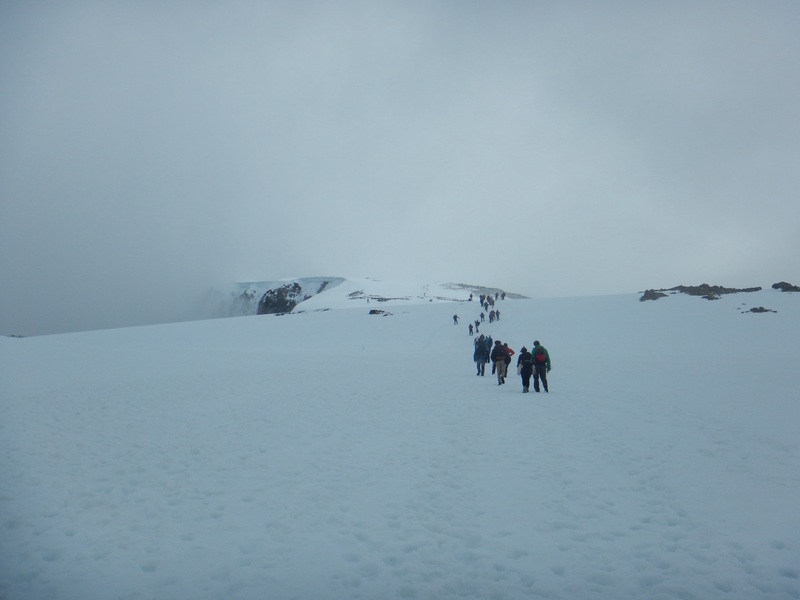 Heading back down through the snow, it was difficult to keep the boots dry with the 1.5m (5ft) snow base. The soft snow made each step sink down, as a foot would tend to slide out from time to time. Coming out of the cloud cover, the view down below opened up and was gorgeous. I couldn’t believe the day we had hiking with such great weather. No rain or anything, just sunshine and some clouds on the top. 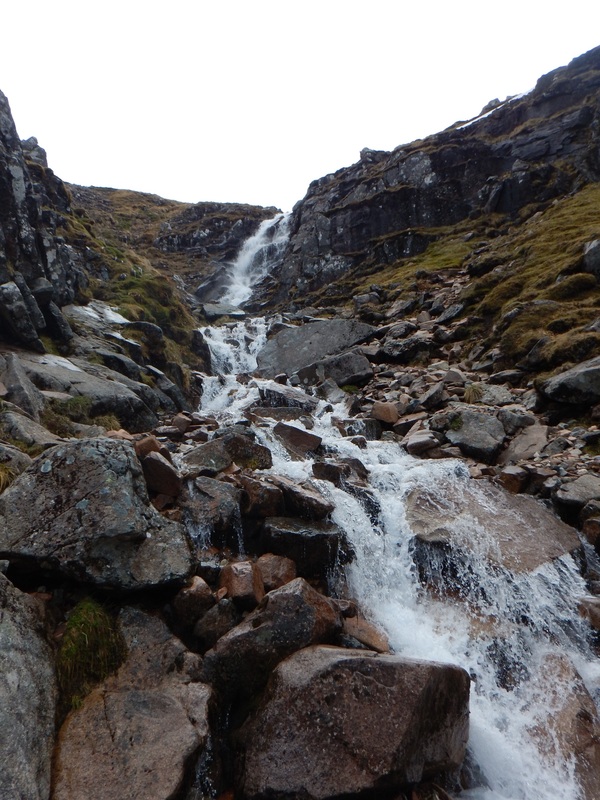 The loose gravel switch backs were a bit tricky but we all made it down to the lochan nice and safe. 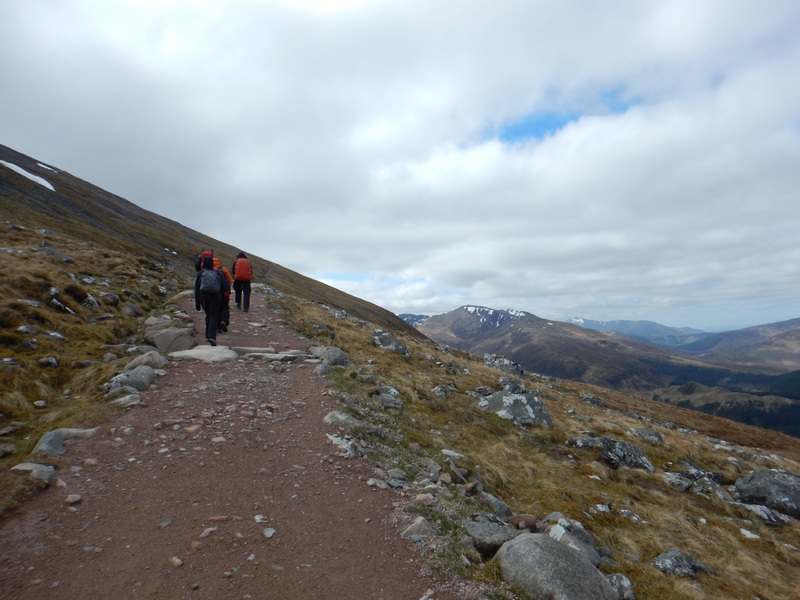 After the path flattened out by the lochan, the last set of switch backs and final descent was ahead of us. Stepping down from the rock stones, this is where mental and physical fatigue would get people with the tricky steps. Focusing on each step as to make sure we wouldn’t slip or twist and ankle, made for a slower pace. Not before long, we were back down at the bottom. 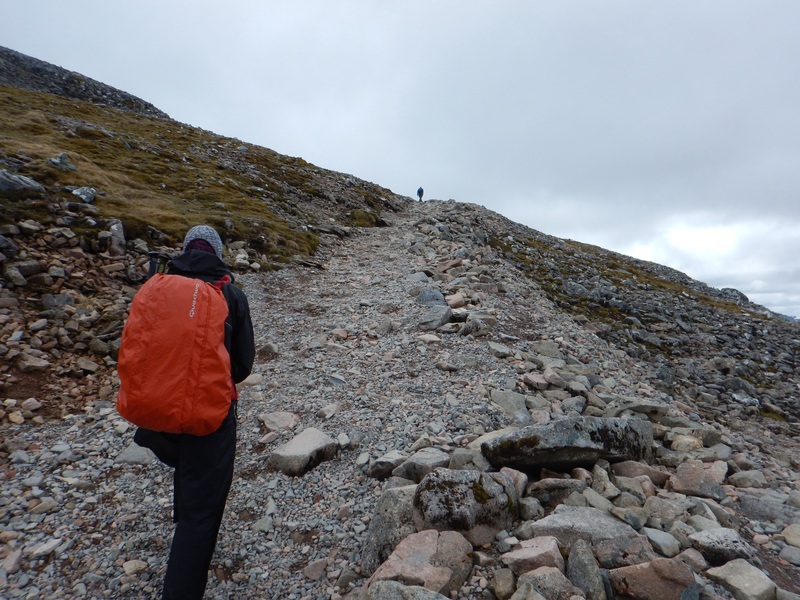 It had been a great day of hiking up the tallest mountain in the UK. 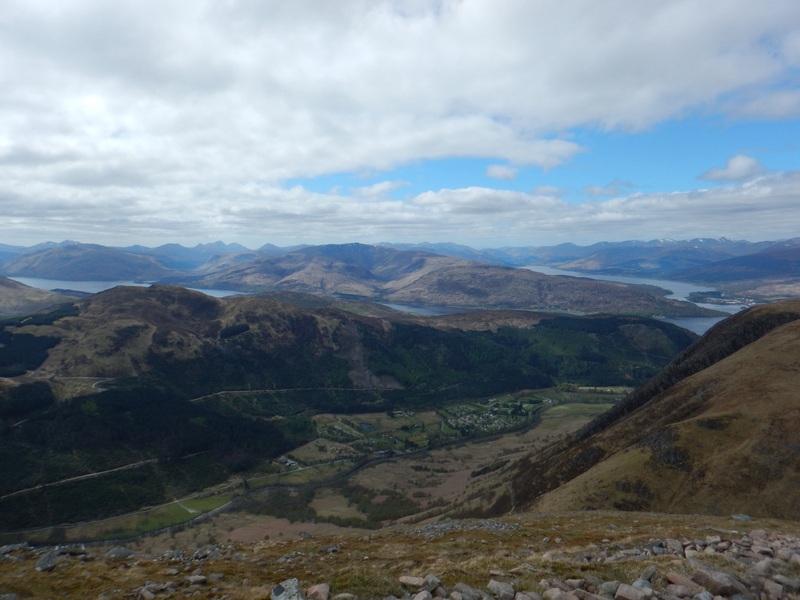 Hiking Ben Nevis, was a blast and I was so excited about the great weather and views that we were able to experience along the way. 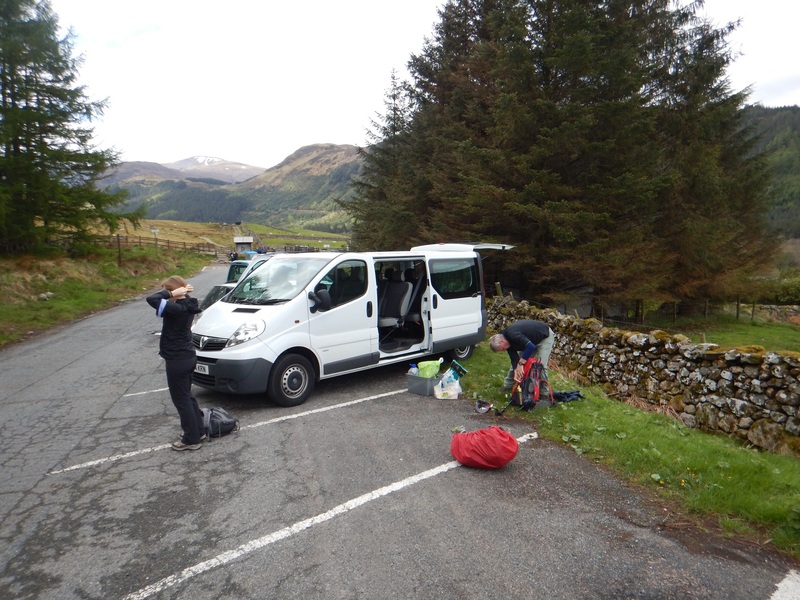 We dropped our bags off at the van and walked to the pub to enjoy a pint and talk about what a great time we had. That last picture DOES explain it all! What a great hike! Looks like a lot of hikers that day. Was it a busy trail? Quite a bit of hikers but not overly crowded. The nice day definitely made for some more people I’m guessing.